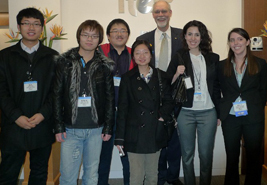 TSA students pose with Robert Wunderlich, international president of ITE, at a reception for students held at ITEs international headquarters during TRB 2011. InTrans congratulates the Transportation Student Association (TSA), ISU’s student chapter of the Instiute of Transportation Engineers (ITE), which has been named Student Chapter of the Year for both Missouri Valley ITE (MOVITE) and its district organization, Midwestern District ITE. These competitive awards are offered annually to a student chapter whose annual report of activities is selected as the most outstanding based on guidelines established by ITE. Nadia Gkritza, assistant professor of civil, construction, and environmental engineering and director of ISU’s Interdisciplinary Transportation Graduate Program, believes this is the first time the Cyclones have won both the MOVITE and the Midwestern District ITE awards in the same year. “Now the TSA’s entry will go on to compete at the international level,” she says. Monthly Speaker Meetings: Speakers have come from as far as California (Mike Dreznes, VP, Barrier Systems, Inc.) and as near as the Iowa DOT (John Adam, Director of Statewide Operations, Highway Division) and have discussed topics as varied as design of toll-operated urban freeways, construction specifications and airport design, visions and challenges for the future of highway transportation, traffic operations technologies, international advances in transit, microsimulation modeling, dynamic highways, and forgiving highways. ITE Midwest Annual Meeting: TSA members attend this event each year, and a TSA team competes in the Traffic Bowl, a quiz-bowl competition for students. Engineering Day at the Mall: TSA had a display and interactive activities for children and adults at this annual event at a local mall. Ames Middle School Day: For this annual event on ISU’s campus TSA set up a display and led interactive activities for Ames Middle School students. CCEE Departmental Picnic: At this annual social event of the Civil, Construction, and Environmental Engineering Department, TSA had a display and answered faculty and student questions about the organization. In-Class Recruitment: A TSA cabinet member spoke to the CE 355 class (Intro to Transportation Engineering) about the TSA activities and member benefits. Social Events: Each semester, TSA hosted Bingo night, Jeopardy tournament, ice skating, and bowling night for members and friends. More information about TSA activities and members is online.